Despite plenty of Amazon selling opportunities and niche products still out there for the taking, we know that sometimes not every element of starting a business with Amazon FBA can be easy. So that’s why, I’m officially announcing the debut of our newest Amazon seller app, Jungle Scout Market. Yup, the Jungle Scout app suite is getting a new tool to help you make an easy transition from wherever you are in the process now to full-time #freedombuilder! It’s going to be an incredible application, and of course we’ve got the best team on it. We’ve actually brought on some of the top minds in tech for this one, including our big time product manager, Joel Popoff who’s lent a hand to some of the biggest tech startups in the world. With the Jungle Scout Market, you won’t have to browse through thousands of unqualified freelancers. The Jungle Scout Marketplace offers only verified pros that have been fully vetted by the Jungle Scout team. What does Jungle Scout Market do? At Jungle Scout, we’re constantly surveying our fans and #freedombuilders to find out what’s most important to them. This isn’t just my baby, but it’s yours, too. That’s why we took your suggestions and concerns and put our team to task on filling the gap that we noticed existed between product research/sourcing and launch. That massive area of opportunity we determined was actually offering help to new sellers during the product launch phase. We knew that a lot goes into building a product listing, and it’s not just something any layman can do. After all, copy writing, product photography, graphic design, and translation are all specialist skills. So I thought, why not create a marketplace where sellers can hire Amazon-specific professionals to help them with these tasks? And that’s how Jungle Scout Market was born. Why Not Use Fiverr or Upwork? As far as freelance sites go, both Fiverr and Upwork do some amazing things. And even I have used their services in the past. However, when it comes to finding services for Amazon sellers, there are a few huge drawbacks to those massive platforms. First, there’s no real emphasis on just Amazon selling. Sure, there’s a few people who claim that they can do the required tasks, but as you might know from experience or reading our blog, Amazon has some very specific qualifications for product photos, graphics, and copy. Also, there’s hundreds of thousands of sellers on all these platforms. It can be overwhelming combing through all those sellers to find “the right one.” Plus, there’s no system of vetting that goes on with those platforms. It’s every person for themselves in those spots. What Makes Jungle Scout Market a Upwork or Fiverr alternative? When we went to create Jungle Scout Market, we didn’t want to just create yet another freelancer platform. It was important to us and our sellers that we created something that really stood out. This new platform had to be something that was tailored specifically for Amazon sellers. Additionally, we wanted to capitalize on what we saw were major opportunities to Upwork and Fiverr. Jungle Scout Market is for Amazon sellers. Jungle Scout Market is Amazon specific. That means, the freelancers who are selling their services actually have experience with Amazon. The product photographers know how to take photos of Amazon products, both main images and lifestyle. The copywriters understand what keywords they need to put into the listings to get more clicks. And their descriptions are built to convert, meaning more sales for you. The translators are experienced copywriters, too, meaning that when they translate your product for the EU or another market, none of the necessary sales language gets lost. Finally, our graphic designers know how to make product packaging that not only stands out and makes sales, but also conforms to Amazon’s high standards. Jungle Scout Market limits the number of sellers on the platform. We’re not just letting anyone through the door. When we launched, we wanted to make sure that we offered only the best. Fiverr and Upwork are crowded with sellers with subpar skills underselling the real talent. That’s not to say that Jungle Scout Market is priced higher than those platforms. On the contrary, Jungle Scout Market actually finds the perfect balance between price, talent, and speed of delivery, to offer you the absolute best value. Jungle Scout Market hand vets each and every seller. The one major difference that makes Jungle Scout Market a great Upwork or Fiverr alternative is that we actually take the time to review and vet each and every seller that comes onto the platform. Joel and I have built an elite cadre of professional, Amazon-specific freelancers, placing them through the same rigorous hiring process we’d put a typical Jungle Scout employee. Our benchmark was simple: if it wasn’t good enough for me or Joel, then it wasn’t good enough for you. How do I use Jungle Scout Market? The process is simple. Simply head over to https://market.junglescout.com, create a profile, and start looking for sellers. 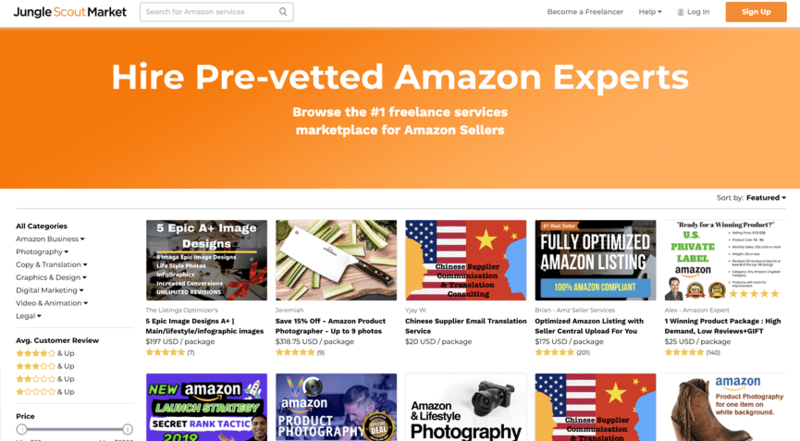 Whether its product photography, graphic design, translation, or copywriting, we’ve got you covered with just about everything you need to successfully launch a profitable Amazon product. And although those four big categories cover a whole lot of bases, we’ll have even more services offered later this year. Those services include: video, digital marketing, and business. We really want to blow things up in 2018, and we know that connecting you to the right people to help you bring your Amazon FBA business from zero to one is the right move. What else should I know about Jungle Scout Market? Not only does Jungle Scout Market help connect you to awesome people, but you can expect all the same, great things that Jungle Scout’s app suite has provided Amazon sellers for the last 3 years. After all, there’s a reason that we’re number one. Jungle Scout Market will provide amazing educational content for Amazon sellers and freelancers alike. We don’t just we want our sellers to know how to effectively hire and utilize freelance services. But we want to make sure that the freelancers are doing everything they can to forge fantastic freelance practices, too. If you’ve ever tried contacting customer support using Upwork or Fiverr, I’m sure you know how much of a headache that can be dealing with outsourced customer support. That’s why the same customer success brilliance we’ve delivered to our customers with our other five apps, will continue with Jungle Scout Market. We never outsource. And our customer success team are experienced Amazon specialists who can not only help you with Jungle Scout Market but also Amazon selling. It’s pretty amazing when I look back at everything that’s happened with Jungle Scout in the last three years. As of this writing, Jungle Scout holds nearly 80% of the market share for Amazon seller tools. That tells us that you, our loyal fans and #freedombuilders, trust us, and only us, for your Amazon seller resources. We could simply let those metrics go to our heads and just stop building, but that’s never been good enough for me and my team. It’s our mission to constantly improve and evolve. Just think. Each new application is an opportunity to help more and more aspiring entrepreneurs claim the lives they know they deserve. And with each new #freedombuilder we put out into the world, the better this world becomes. Jungle Scout Market is something exciting, new, and powerful. And we look forward to seeing how much it ends up helping all of you.